Sufjan Stevens will jingle-jangle his way across America, bringing yuletide cheer to your local music club, sharing reverent hymns and pop carols from his upcoming Christmas album Silver & Gold. “The Sirfjam Stephanapolous Christmas Sing-A-Long Seasonal Affective Disorder Spectacular Music Pageant Variety Show Disaster” will be a tragic-comedic feast for the ears and eyes. Sufjan will be joined by a 5-piece band (including Rosie Thomas, Nedelle Torrisi, Casey Foubert, James McAlister, and Ben Lanz) playing all the hits from both Christmas box sets. Send us your song requests! All Grinches be forewarned: the show will consist entirely of Christmas music, inviting audience participation. Be prepared to sing along with bawdy bravura! Song sheets will be provided. There should be plenty of low-production props and gags, dollar-store giveaways, inflatable unicorns, cheap confetti, make-shift costumes, and Gloria in excelsis deo. 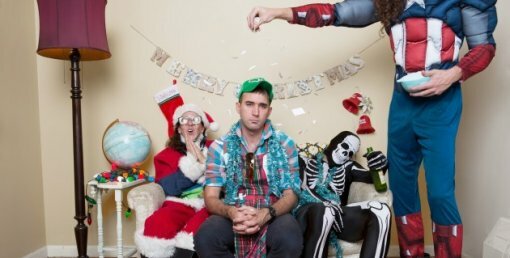 Wear a santa hat, bring a flask (and a friend) and join the Sufjan Christmas Spectacular Sing-a-long in drunken revelry. Extra-special guest Sheila Saputo—the hottest ticket from Gary, Indiana—will be opening all dates with her indelible ice-breaking pizzazz. Tickets for The Surfjohn Stevens Christmas Sing-A-Long Seasonal Affective Disorder Yuletide Disaster Pageant On Ice at the Bowery Ballroom (Dec 21-22) go on sale on today (Oct 12) at noon ET. The 58 song hereSilver and Gold collection will be released on 5 CD box set and digitally on Nov 13 via Asthmatic Kitty (the limited edition vinyl box set will ship around December 31, 2012). Sufjan Stevens tour dates and 58 song Silver and Gold track list after the jump. 20. How Shall I Fitly Meet Thee? 33. Do You Hear What I Hear? 47. Let It Snow! Let It Snow! Let It Snow!